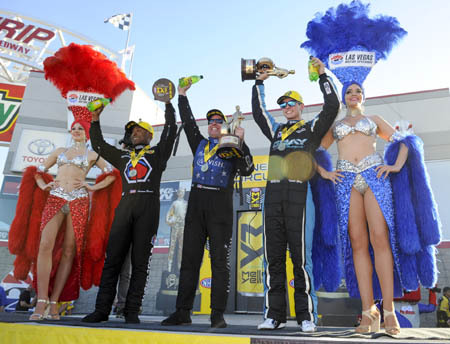 For the first time on the West Coast, the NHRA Mello Yello Drag Racing Series will treat fans to the incredible sights and sounds of four-wide drag racing during the 19th annual DENSO Spark Plugs NHRA Four-Wide Nationals, April 6-8 at The Strip at Las Vegas Motor Speedway. The early-season race is the fourth of 24 events during the 2018 NHRA season, and the first of two annual events in Las Vegas, but the spring race will have a distinctly different feel this time around. The speedway widened The Strip at Las Vegas Motor Speedway to four lanes, giving fans on the West Coast an opportunity to witness one of the biggest spectacles in drag racing. The unique experience is a thrill unlike anything in motorsports, as four 10,000-horsepower nitro-burning machines will power down the dragstrip simultaneously. "It will be a lot of fun going to Las Vegas for a four-wide race," defending Top Fuel event winner Antron Brown said. "It will give our fans on the West Coast what the East Coast fans have had at Charlotte (since 2010). It will be a real spectacle with four 10,000-horespower cars launching at the same time. That will shake Vegas down. It will be a really cool experience." Brown (Top Fuel), Tommy Johnson Jr. (Funny Car), and Tanner Gray (Pro Stock) were last year's winners of the event that will be televised on FOX Sports 1, including finals coverage starting at 6 p.m. (ET) on Sunday, April 9. Brown earned his second straight win at the spring Vegas race in Top Fuel a year ago, grabbing the 300th team win for Don Schumacher Racing. The three-time world champion ended 2017 with four victories and 10 final-round appearances, and his first win of 2018 will give the standout 50 career Top Fuel victories. He'll have to do it against stars like Tony Schumacher, who has eight wins in Vegas, defending world champion Brittany Force, Steve Torrence, who won in Phoenix, Pomona winner Doug Kalitta, Richie Crampton, Leah Pritchett, Terry McMillen and Clay Millican. In Funny Car, Johnson picked up his first win of the season and first career at The Strip at Las Vegas Motor Speedway in 2017, knocking off rookie Jonnie Lindberg. He'll try to make it two straight wins in the loaded class against a talented group of competitors that includes six-time Vegas winner John Force, 2016 world champ Ron Capps, five-time Vegas winner and defending world champ Robert Hight, Pomona winner and current points leader Matt Hagan, Courtney Force, who won the most recent race in Phoenix, J.R. Todd, Tim Wilkerson, and class newcomer Shawn Langdon. celebrates their wins last year. 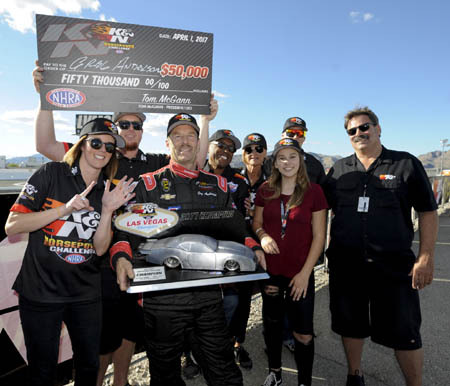 Gray became the youngest Pro Stock winner in NHRA history when he earned his first career victory a year ago in Vegas. Gray finished 2017 with five victories and was named NHRA's top rookie, and is seeking his first win in 2018. He'll face off against Pomona winner and defending world champ Bo Butner, Phoenix winner Chris McGaha, Greg Anderson, who has eight career wins in Vegas, Jason Line, five-time Vegas winner Jeg Coughlin, two-time world champ Erica Enders and Drew Skillman. The event also features the K&N Horsepower Challenge for eight of the best Pro Stock drivers. Bragging rights and a hefty $50,000 paycheck is on the line in the specialty race that takes place on Saturday. Anderson is the defending K&N Horsepower Challenge winner and will be looking for his third straight win in the specialty race. Along with the on-track action, the DENSO Spark Plugs NHRA Four-Wide Nationals will honor first responders with NHRA's "Salute to First Responders" celebration. As always, fans will have the opportunity to interact with their favorite drivers as they're granted an exclusive pit pass to the most powerful and sensory-filled motorsports attraction on the planet. This unique opportunity in motorsports gives fans direct access to the teams, allowing them to see firsthand the highly-skilled mechanics service their hot rods between rounds, and get autographs from their favorite NHRA drivers. Fans also will want to visit NHRA's popular Nitro Alley and Manufacturers Midway, where sponsors and race vendors create a carnival atmosphere, with interactive displays, simulated competitions, merchandise, food and fun for the entire family. Mello Yello Drag Racing Series qualifying will feature two rounds at 12:30 and 3:30 p.m. on Friday, April 6 and the final two rounds of qualifying on Saturday, April 7, at 12:10 and 2:45 p.m. The first round of the K&N Horsepower Challenge will take place at noon on Saturday. Final eliminations are scheduled for 12 p.m. on Sunday, April 8. To purchase general-admission or reserved seats, call (800) 644-4444 or visit www.NHRA.com/tickets. Kids 12 and under are free in general admission areas with a paid adult. To honor the Salute to First Responders, military and first responders can save 20 percent on general admission tickets at the gate.